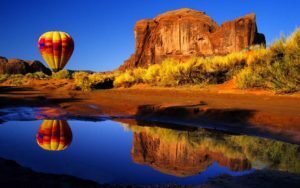 The Arizona Balloon Club, as it is commonly know as today, was founded in 1974 as The Gila and Salt River base and Meridian Hot Air Balloon and Airship Ascension Social Society, Inc. The Club is dedicated to perpetuating the sport of Hot Air Ballooning. Made up mostly of sport balloonists our membership does include a few experienced gas balloonists (those are the balloons you see in the old movies with the nets on them and sandbags hanging off the sides), as well as, several full-time commercial balloonists. The Arizona Balloon Club fosters safety and education in our sport, holds competitions, sponsors safety seminars and holds regular monthly meetings. When we aren’t flying, we talk about balloons, look at pictures and keep watching the sky and the thermometer to be ready for our next flight! Club General Meetings are held the third Tuesday of each month at 7:00 pm. Do check this site periodically for updates on meeting locations and special guest speakers. You need not be a member to attend – guests are always welcome! Come and see what we are all about. For more information on the club’s events and activities please explore this site. **Be sure to check our event schedule before general meeting date as location is subject to change certain months.